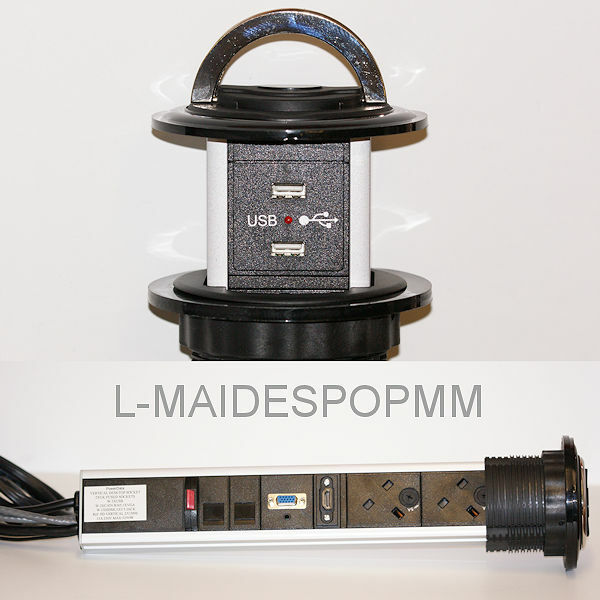 This vertical in desk power dock is a grommet style pop-up power and data unit, which is fitted into the desk. When not in use, it can be closed down into the desk and hides the sockets. Almost all of the Power Dock is stored below the desk surface, and when in use all you need to do is pull the unit up with the metal handles until it locks itself in position. The Power Dock is easy to install and retrofittable. 2x 13 amp sockets individually fused at 5amp each connected to a 0.5 Metre male GST18 connector. 1x Dual 1 Amp USB charger. 1x 3.5mm stereo audio jack socket with 2m lead ending plug. The Horizontal In Desk units are terminated with a male GST18 connector. This allows multiple power cable lengths using Start leads.